Coffeeology | Expresso yourself. So many blends, so little time. Take life one sip at a time. Stay grounded. Better latte than never. Take time to smell the coffee cover. I’ve been exfoliating my face for many years now and I do it at least three to four times a week. As soon as I get home from work or after a night out, with a face full of make-up – I always make sure to exfoliate my face. Even if I don’t wear make-up, I still always exfoliate. It just feels so refreshing once I’ve done it and I love the way my skin feels afterwards, clean and super smooth. Exfoliating your face regularly helps your skin to become healthier in appearance and once the dead skin is removed, it helps to get rid of dirt, dried sweat, and every-day air pollutants. Also another good reason to incorporate exfoliating your skin is that it will absorb moisture better, keeping the skin soft and supple. Did you know that gorgeous 80’s supermodel, Christie Brinkley exfoliates every single day, without fail – and look at her!! She looks amazing for someone who is 63 freaking years old!! Now before you start to exfoliate every single day, ala Christie Brinkley, just know that over exfoliating is a big no no. Why? While regular exfoliation is good and so very healthy for your skin, over doing it will cause excessive dryness, irritation, redness, sensitivity, shiny forehead (over exfoliating can reproduce almost a mirror like effect on your forehead!! ), puffiness, and skin breakouts (over doing it removes the healthy skin cells that protects your skin’s barrier). In the past few months, I finally jumped on the coffee scrub train and it literally changed my life – er, um… OK, it changed my face! So what is so great about the coffee scrub? Well, let me tell you! 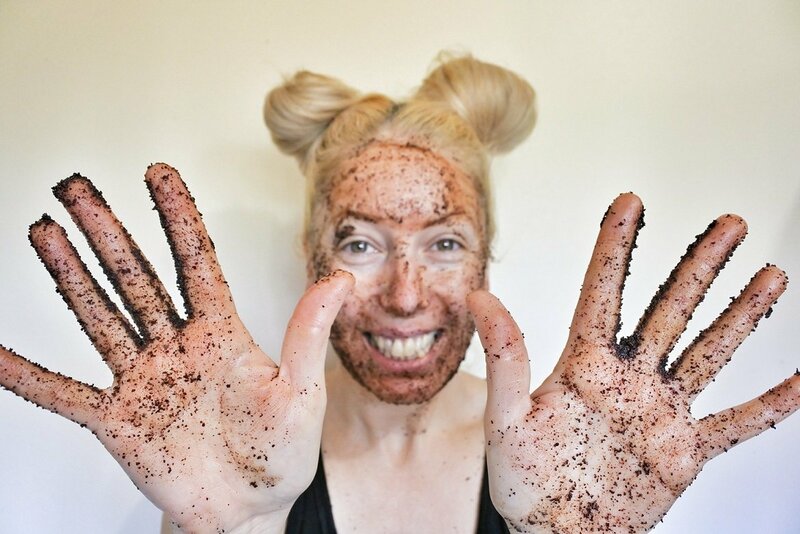 The coffee scrub has so many benefits that include: exfoliating and anti-inflammatory properties, temporary reduction of cellulite (used on the body), improved circulation, reduced eye puffiness, smoother and tighter skin. Coffee is known to stimulate blood flow to the skin, which improves the appearance of fine lines, stretch marks, cellulite and other skin conditions. Caffeine also contains many antioxidants which are great for our skin including fighting the battle against premature aging of the skin, and also contains UV protectors which really are self explanatory [blocks out harmful rays from the sun,which in turns help us in the fight against premature ageing & skin cancer]. The cleansing element of coffee is another super beneficial factor; this cleanser takes away strong odors by neutralizing & absorbing them. Now depending on the additional ingredients in the coffee scrub packet, majority of them usually contain many great exfoliating properties. Along with the coffee granules will usually find a mix of sugar, coconut, lime, cinnamon and/or salt. The combination of these bring in their own benefits along with additional process of buffing away those dead skin cells. The amazing thing also about a coffee scrub is that it can help to reduce the appearance of cellulite, temporarily. By scrubbing in circular motion, the fatty acids, antioxidants and the many vitamins in the coffee scrub, will help to restore the skins texture and the appearance of cellulite, and tighten the skin. Not only are coffee scrubs great for your body and face, they are also such an amazing relief for your feet! If you’re constantly on your feet for long hours of the day, and especially like me, spend a lot of time in heels – then this is for you! Grab a small bucket or basin with warm water, and mix in half a cup of coffee, and swirl it around. Place your feet in the mix and feel the soothing affects of the coffee in your feet. You can also at the same time, grab a little of the coffee and scrub away at your feet to remove the dead skin and refresh your feet. Your feet will feel smooth and soft, and no longer tired. No, you don’t scrub the coffee onto your eye area!! Serious ouch!! Because I am such a night owl, working away on my blog and/or catching up the latest on my favourite television shows, my poor eyes will often the next day become all puffy-eyed. One tip I have recently discovered is this: in the morning as you’re getting ready, place a little coffee scrub around your eye area underneath for an instant pick-me up!! Mix a teaspoon of coffee scrub with a few drops of water, in a cup and gently apply it underneath your area. Leave it there for 5 – 10 minutes and then rinse. The caffeine will tighten the skin, which in turn it will reduce the puffiness and voila! My face after it has been coffee scrubed!! As I said earlier on, I use the coffee scrub at least three to four times a week, basically every second day and most definitely on a day that I have worn make-up. This coffee scrub is one that definitely won’t dry out your face, and your skin will feel so clean, smoother, firmer, tighter and radiant. I seriously recommend it! Coconut and Lime Scrub is made up of 100% Arabica Coffee beans which helps reduce the appearance of cellulite, stretch marks, acne, eczema and varicose veins. The scrub also contains Vitamin E, which helps repair and rejuvenate your skin.
? 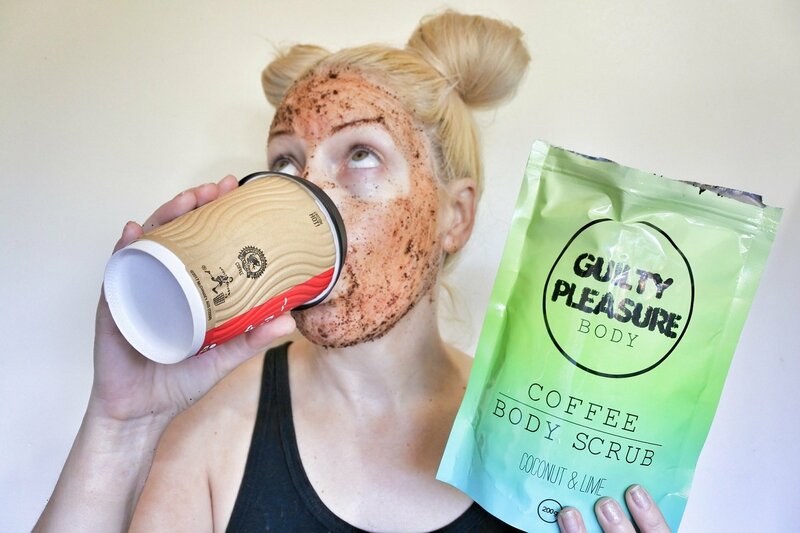 Guilty Pleasure have sent me their coconut & lime coffee scrub for me to review (thank you!) – all opinions are 100% my own, and true – full disclosure policy here. If you purchase a product from their website make sure to use the coupon code FEELSGOOD to get 10% off!